Sounds like you need to CALM THE F*CK DOWN. 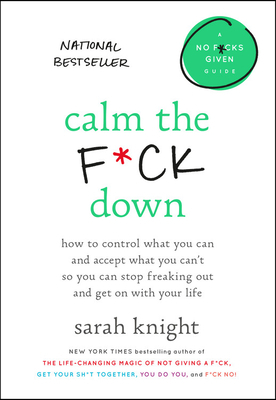 Sarah Knight's first book, The Life-Changing Magic of Not Giving a F*ck, has been published in more than twenty languages, and her TEDx talk, "The Magic of Not Giving a F*ck," has more than four million views. All of the books in her No F*cks Given Guides series have been international bestsellers, including Get Your Sh*t Together, which was on the New York Times bestseller list for sixteen weeks. Her writing has also appeared in Glamour, Harper's Bazaar, Marie Claire, Red, Refinery29, and elsewhere. After quitting her corporate job to pursue a freelance life, she moved from Brooklyn, New York, to the Dominican Republic, where she currently resides with her husband, two feral rescue cats, and a sh*tload of lizards. "Practical, not at all preachy, this book will take you from break-up to car breakdowns, and keep you calm all along the way. "—Irish Examiner, "Top 100"
"If you like your self-help books to be no-nonsense then you'll love the work of Sarah Knight... a practical way to tackle overwhelming situations with no BS. "—Woman's Way, "Book of the Week"